UPDATED: I raised. I ran. I conquered! Easter Island is definitely one of the many places on my Bucket List I must visit and witness in person. I actually have a couple friends venturing there next year..they invited me to join them once they got to Easter Island so we shall see if my dream comes true very soon. The island is located in the southeastern Pacific Ocean near Chile completing the Polynesian Triangle. The history of the island is very VERY fascinating! If you don’t know the story.. I’d suggest doing some research- I don’t want to give away all the juicy details 😉 I actually learned more about the island watching the documentary on Netflix 180 degrees South a couple of months ago. It’s a great movie about a young man’s journey to Patagonia (plus much more)- check it out! I’m not a huge fan of the clouds I did- it’s tough to get the perfect fluffy texture (I know I’m my biggest critic..haha)! 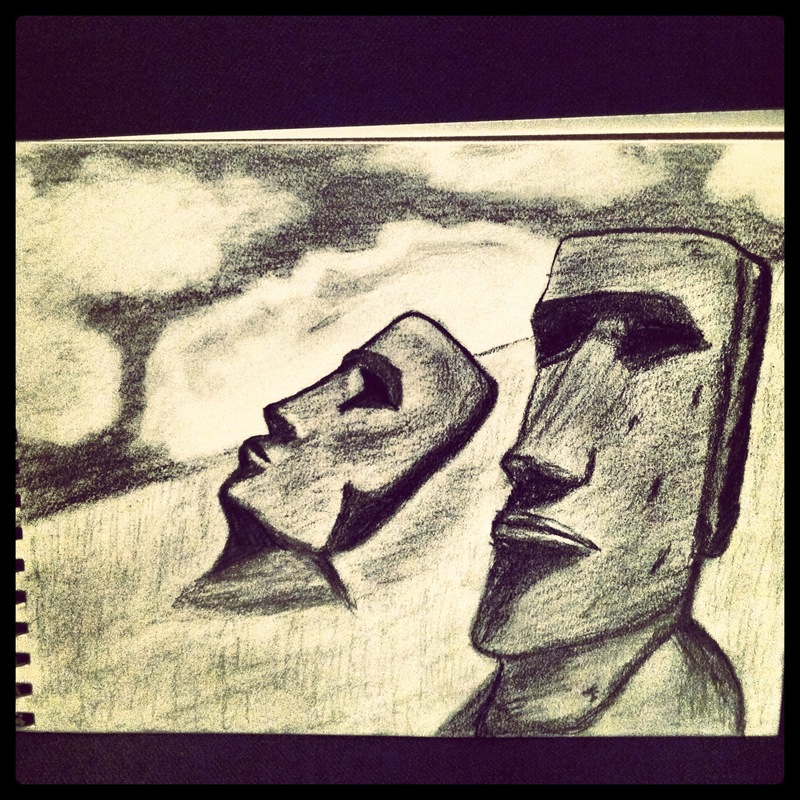 At least the Moai look pretty cool, huh?! Took me about 30 mins to pencil sketch this out while doing laundry 🙂 I’ve got to find a little frame for this sketch and hang it in my place. Have any of you been to Easter Island before?! What’s one of the top places on your travel list to visit before you die 🙂 ? I hope we get to go to this island together, I love my moai that came from Easter Island! Pretty darn good artwork, if you ask me. Clouds too. Easter Island also on my BL. But I didn’t know about the bodies underneath. Now that adds even more to the mystery!